Modern car bumpers are, in the vast majority of cases, like famous heiresses: beautiful, and useless. They just don't work. There've been many studies and articles decrying the often insane amount it costs to repair damage from fairly minor accidents in modern cars — in many cases, thousands of dollars for a repair from a mild impact — but little talk about the fundamental problem: Modern car bumpers are designed to break. Here's why. I guess I better qualify how I think bumpers "should" work, if I'm going to get some good griping in here. A car bumper should be that part of a car that satisfies the elusive "dual crap" criteria: it should be able to take some, without you giving any. An ideal car bumper should allow you to impact another car or object, stationary or motile, at speeds below, say 5 mph, with zero visible damage. A good car bumper should provide the driver with a sort of buffer zone, where small errors in judgement or ability can be absorbed, without repercussions, and forgotten. 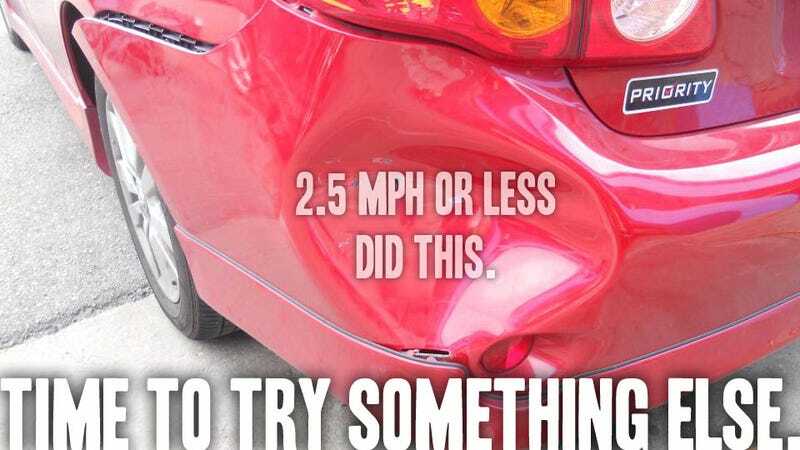 Modern car bumpers do not do this. There was a time, in the otherwise dark Malaise Era, where bumpers did achieve this Platonic ideal; however, to achieve this, sacrifices had to be made. It's this relationship that forms the basis of the Bumper Conundrum. The Bumper Conundrum is the name professional bumper researchers have given to the two-axis relationship of bumper use and aesthetics. Broken down to its simplest level, it comes to this axiom: the better a bumper is at absorbing damage, the less people like the way it looks. You can plot any bumper on a two-axis graph, with one axis being aesthetic success, and the other durability, and you can see the sweet spot in the upper right, a hypothetical attractive bumper that weathers damage well. Most modern bumpers, and most bumpers up until the early 70s, usually score well on attractiveness, and low on durability. Earlier, chrome bumpers from the 40s-60s are often a bit more durable than the modern, painted-cover bumpers, giving today's cars the lowest ebb of bumper usefulness. Of course, the most recent designs do have a bit more of an excuse, as they do have to conform to more stringent pedestrian-impact standards, which means many modern bumpers rely more on collapsible-energy absorbing materials, and stiffeners to prevent legs from being drawn under the bumper. Pedestrian impact is an important consideration, and one that the durable bumpers of the 70s-80s didn't really care too much about, having more of a hose-off-for reseale sort of approach to pedestrian impact. Still, pedestrian safety and bumper durability/ease and cost of repair don't need to be mutually exclusive. I hope. Older designs, usually in chrome with some rubber for impact strips and guards, held up a bit better than many modern designs for many sorts of impacts due to their lack of paint, and the heavy metal blades' durability. They were also cheaper to repair, generally. With my old '73 Beetle, I consider the bumper blades consumables, like tires or wiper blades; they're far from the body, can take one or two good whacks, and then it's $50 and four bolts to put a new one on. They sacrifice themselves to protect the painted body, and I'm fine with that. In big wrecks, though, they don't do much. Modern car design has abandoned the bumper, visually. 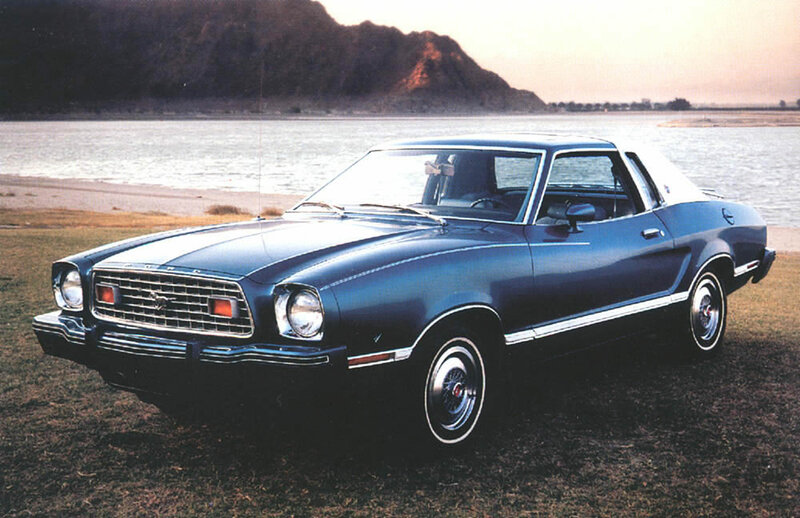 With the advent of integrated, body-color-matching bumpers in the late 80s (there were earlier precedents, of course, like our pal the Mustang II), bumpers have now been totally consumed into the body, the actual impact bars and brackets completely enclosed with plastic or fiberglass painted covers. These covers, while great for aerodynamics and styling, not only allow other, breakable elements onto the bumper surface (grilles, lights), but by being painted, have become as expensive as body damage to repair. This is stupid. Modern cars, of course, are much safer in a large-scale crash than ever, but the bumper only a small part of this; chassis engineering, crumple zones, and all that exciting engineering get that credit. Bumpers in modern cars are a lot like the health insurance I've been able to afford: terrific for catastrophic accidents, worthless for anything else. So, unless your car driving plan consists of years of happy motoring ending in a spectacular wreck into a helicopter off the roof of a parking garage, modern bumpers probably aren't going to be useful to you. The peak time of bumper usefulness was between 1974 and 1982, when government regulations mandated bumpers that could withstand, without damage, impacts up to 5mph. After 1982, the impact standards were halved, mostly as a sop to auto manufacturers, who wanted cheaper bumpers. As an extra little f-u to consumers, damage was now restricted to "unlimited" as well. The bumpers during the 5 mph era are well known to many gearheads, and usually not fondly, almost entirely because of the way they looked. Think chrome bumper vs. rubber bumper MGB. They tended to be huge, chrome and black rubber diving boards, mounted to the car via massive shock-absorbing pillars. They generally weren't pretty, but, to their credit, they worked great and held up well enough that they usually didn't get any uglier. In fact, often the black rubber would age into this velvety-looking finish that is weirdly appealing. Velvety blackness aside, most people find the bumpers pretty ugly. I saw a Dino on the street the other day, and was kind of amazed by the brutal mechanical beefiness of the bumpers. They made it fit with the overall chunky look of the car, but it is hard to picture such bumpers on modern-designed cars. I took a walk today to get some pictures of bumpers, and common bumper damage, and what I saw confirmed my thinking. A huge number of late-model cars with painted bumper covers had all sorts of damage from apparently small incidents including paint scratches, scuffs, punctures, cracks, and big caved-in areas. Even bumpers on more rugged-look cars, like Jeeps or FJs that aren't painted are still brittle plastic caps over mostly empty interiors, so they tend to crack and cave in like any of them. I also saw a number of older cars from the '74-'82 era, and their bumpers were remarkably better preserved. These were daily drivers, not garage queens. For a '79 Benz I photographed, the owner was around, and I spoke with her; she'd had the car since new, hasn't had the bumpers replaced, and they— substantial, chrome-and-rubber beasts– looked great. There was evidence of wear, some scratches, but on the whole the bumper design weathered use vastly better than more modern designs. So, fighting my usual megalomaniacal urges, I'm going to try and hold off on any sweeping calls to action. But, I do think it's time to start a real conversation about bumpers: what do we want? Is our current design aesthetic more important than how the bumpers perform? Will an increase in up front cost for stronger bumpers be worth less costs for repairs? Can we grow to love big, black rubber things on the front and rear of our cars? Can auto designers make rugged and pedestrian-safe bumpers cool? Am I throwing my life away thinking about this so much?